Airwheel electric unicycle, X3 is a lightweight personal means of transport, has a very practical travel features, not only in everyday life is so, when traveling as well. For example, the Spring Festival approaching, this is a unique holiday in the year, in such a busy day, take on a Airwheel electric unicycle, X3, stayed a small town or the beach to watch the sea, is a very good vacation. Believe that with El Granville Airwheel electric unicycle, X3 company, journey will be more convenient and comfortable. 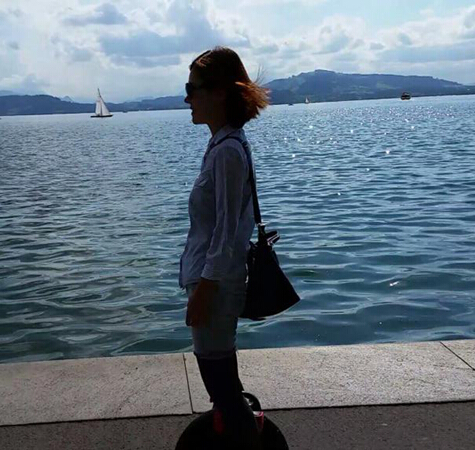 Airwheel electric unicycle, X3 with love while on holiday, there will be surprises. In the past year, you may want to go to the beach for a walk has wanted to many times, but busy work schedule and therefore did not take place. Now, the opportunity is here! Spring Festival holiday is coming, people who have worked hard for a year, coming at least eight days long, dozens of vacation days. Sea of vastness, inclusive, white and beautiful waves, are going to be people's memory. In the sea of other means of transport to take place, with his Petite El Granville Airwheel electric unicycle, X3 can. Perhaps, the road leading to the beach some twists and turns, perhaps, has a long coastline, perhaps, you are too far gone, come back when it failed to set off the interest and energy. At this time, El Granville Airwheel electric unicycle, X3 have a very useful anymore. Its speed, mileage is not far, but you can just fine with people peacefully walking part of the way. Airwheel X3 is always accompanied by good partners, when you feel lonely people on the road. With it, even if it is one man's journey, is not alone. Airwheel electric unicycle, by El X3 is a smart technology was launched in April 2013 new generation transport. Looked at from the outside, El Granville Airwheel X3 electric scooter, X3 is only one wheel. Relative to other means of transport, its appearance is a revolutionary change. El Airwheel electric unicycle, X3 of Warwick properties suitable for short-distance travel, top speed of 18 km/h and 20 km range, and can basically meet the needs of people on a short trip. Airwheel electric unicycle X3 from the date of launch, it has been well received by consumers love, sales are also way hot. You may already have seen in a high-tech industrial zone El Granville Airwheel electric unicycle, X3, because it is very popular with commuters, especially the white-collar middle class's affection. Love, Granville Airwheel unicycle X3 is price very high of a paragraph models, comes as year-end Festival activities of Shi, now X3 only needed 1648 Yuan/Taiwan, has 130WH white, and 130WH black, and 170WH black and 170WH white four paragraph can selected, X3 participation has public baby plans, each pen sold will for Magic bean love engineering donation 1.0 Yuan, has cumulative donation 6856 pen, fast to joined's!